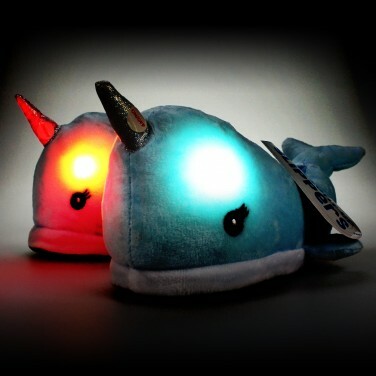 The unicorn of the sea becomes a pair of cosy plush slippers complete with magical horn that makes their cheeks glow! Keep kids cosy this winter in a pair of adorable plush narwhal slippers! 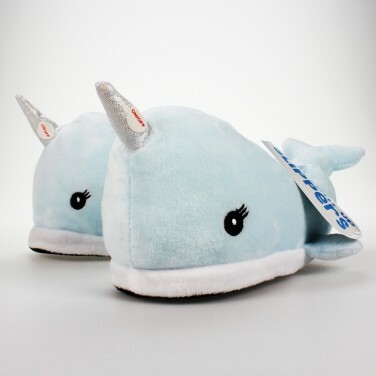 With a soft blue plush and textured sole, these magical slippers have a white glittered horn that illuminates the cheeks of the narwhal with colour change light when you squeeze it! Available in kids size 11-4, these sweet cuddly slippers will keep kids toes toasty and will endlessly entertain with colour change light. A super soft cuddly cushion with vibrant colours and light up stars, this light up unicorn cushion is enchanting! He's so fluffy!!! 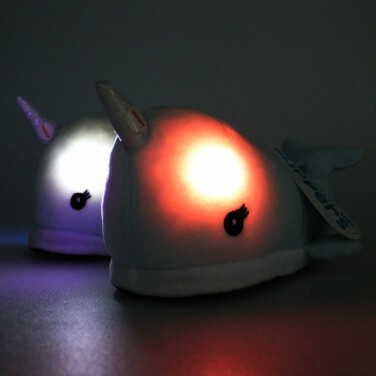 This Fluffy the Unicorn may not actually be fluffy but he does light up with colour change LEDs for a soothing glow. Kids will love these sweet unicorn slippers with their cosy white plush and magical light up cheeks! There's nothing mythical about how cosy these toasty dragon slippers make kids feet feel, and they have light up cheeks too!